Catherine Butterfield, Adam Ferrara, and Peggy J. Scott in It Has to Be You. Photo by Kim T. Sharp. BOTTOM LINE: An amusing new comedy that explores our quests for love and happiness -- and what happens when our families get involved. When it comes to your family, you may love them or you may hate them -- but, like it or not, you’re stuck with them. Perhaps this is why stories of dysfunctional families have been at the center of entertainment for centuries, and why it’s easy to find something to smile about in Catherine Butterfield’s new comedy It Has to Be You. It Has to Be You focuses on siblings Mindy (Butterfield), Frank (Adam Ferrara), and Jed (Jeffrey C. Hawkins) as they learn that their elderly mother, Dorothy (Peggy J. Scott), has discovered a fresh zest for life -- thanks to a newfound relationship with the much-younger Burt (Peter Davenport). Convinced that this gentleman caller is simply after their mother’s vast fortune, the trio sets out to terminate the relationship -- and hilarity and hijinks ensue. For the most part, Butterfield’s play reads like an extended episode of a classic TV sitcom -- and I mean that in the most complimentary of ways. Its characters are all endearingly flawed, its humor is broad and boisterous, and its conclusion is neat and satisfying. And while there are moments the script would have been better served had it more severely deviated from these televisual tropes (its penchant for innuendo, for example, grows tiresome), it still manages to engage and entertain. Helpful, too, is the fact that the script is elevated by a talented ensemble, at the center of which is Butterfield herself. Her Mindy is a treat to watch, partially because she’s so darn easy to identify with; using humor and quirk to disguise Mindy’s flaws and insecurities, Butterfield miraculously manages to create a character that is as relatable as she is over-the-top. Also noteworthy is Jeffrey C. Hawkins, whose smooth, understated performance prevents Jed from transforming into another gay stereotype and instead creates a character worth watching. Set designer Ian Paul Guzzone and lighting designer Michael Megliolia deserve special kudos for transforming such a tiny space into a believably elegant home on the Massachusetts coast. 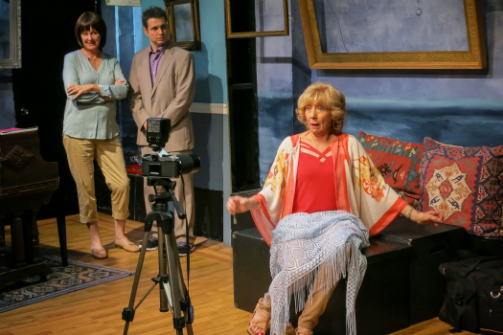 Paired with Stuart Ross’s dynamic direction, which spreads his actors all throughout the space, it’s remarkably easy to disappear into the world of the play once the show begins. Towards the play’s end, Dorothy confesses that she cannot help but love her children, despite their many neuroses. Oddly, this sentiment reflects my general reaction to It Has to Be You. It is not a perfect play, nor is it a flawless production -- but, if nothing else, it is a goofy burst of fun that will distract you from -- or remind you of -- how ridiculous (and ridiculously wonderful) family can be.